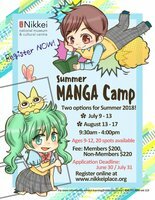 Join us at Manga Summer Day Camp where we have a fun week of activities to immerse all manga enthusiasts in Japanese Canadian arts and culture. There will be a lineup of workshops by local Vancouver comic artists who will share their knowledge of illustration, storytelling, and design to help kids create their own comic booklet to take home! NNMCC . Last modified May 29 2018 9:18 a.m.